The Kansas Dental Charitable Foundation (KDCF) recently created the first annual Kansas Mission of Mercy (KMOM) Bruce Bergstrom Award for outstanding service, which was presented to its namesake at the Annual Meeting of the Kansas Dental Association on Saturday, April 8, 2017. 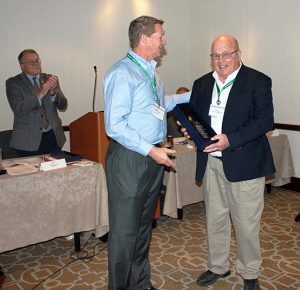 Each year, the Bruce Bergstrom Award will be given to a KMOM general volunteer that exemplifies Bruce’s legacy of service. KMOM was created in 2003 through the leadership and commitment of the Kansas Dental Charitable Foundation and the Kansas Dental Association to provide care to Kansans in need. Since 2003, KMOM has provided over $16 million in free dental care to 28,000 patients throughout Kansas. Bruce Bergstrom’s passion for Missions of Mercy began at the first event in Kansas when his wife, a dental hygienist, suggested he volunteer. He met and talked with low-income Kansans who needed dental services and had no other way to access them, and he became determined to help as many people as he could. Bruce is the founding Executive Director of the America’s Dentists Care Foundation (ADCF). ADCF is located in Wichita, Kansas, and is the organization that provides equipment and technical assistance for nearly all of the Mission of Mercy projects, including the Kansas Mission of Mercy, throughout the country. Through his leadership, dental Missions of Mercy have spread to nearly all 50 states. As of today, ADCF supported projects have provided over $150 million in free oral health care to almost 250,000 patients. Bruce retired from ADCF in 2015, and continues to dedicate his time and skills to help those in need. 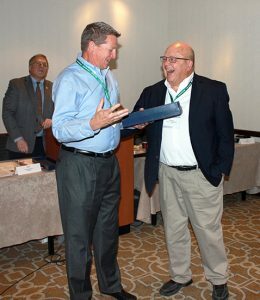 KDCF President, Dr. Mark Herzog, presents Bruce Bergstrom with his award.